We heard about this place from some fellow family travelers. It’s always important to pick the brains of other families who have been to these places before. 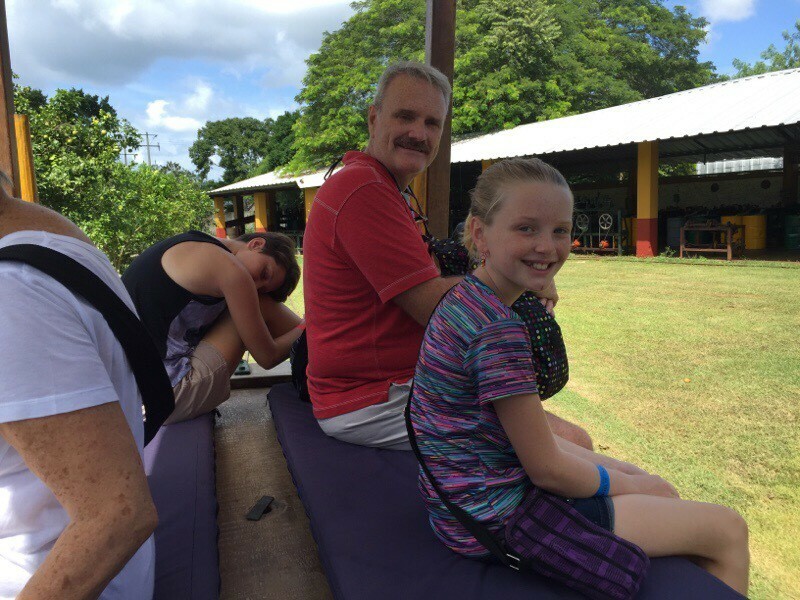 Families are different than your average tourist and we like to stick together and learn from each other. So my good friend told me this rope making plantation was one of their favorite things to do. I love ruins but I also like learning new things so I wasn’t too disappointed when the kids voted for rope making. Or, actually, when they voted against ruins thinking the other option was sitting around all day on video games and YouTube. Not happening. Good trick, Mom. The Hacienda is about 80 km outside of Merida and we had to leave the house at 9:00 am on the dot to get there in time for the tour that started at 10 am. This alone prompted much groaning but at 9:22am we departed amid the nagging of 2 punctual parents. Well, this is not our first rodeo, we padded the drive time and Daniel drove like a bat out of hell hastily so we got there just in time. There are very nice roads in this part of Mexico. The tour was in English and Spanish. The girls and I can do tours in Spanish but in general we prefer it in English so we don’t have to try so hard to understand it. Tour guides tend to talk fast and if it’s a new subject for us it’s doubly hard. So English it is and we were pleased! 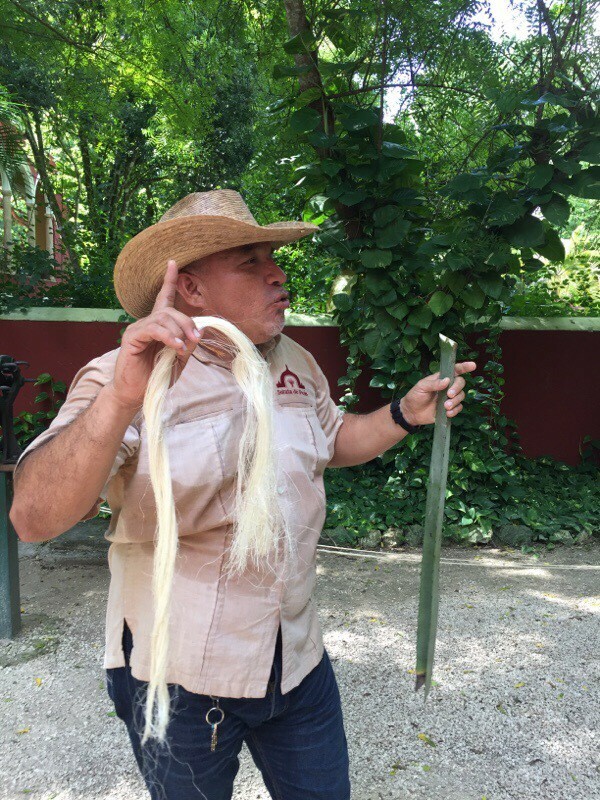 The big picture summary goes like this: The Mayans had been using local agave plant fibers to make a rope product called henequen. They did not have the wheel so they had to find good ways to carry items, and they needed to protect their feet. They used deer hide for the soles of their sandals and this rope to tie it to their feet. They also constructed backpacks out of this rope. After awhile those pesky Spaniards showed up on the scene and started creating haciendas hither and yon. What is this, New Spain?? Mexican historians will giggle at my joke, because that’s what Mexico used to be called. But I digress. Haciendas are big houses where the owners would stay (but not live) while they kept an eye on their workers working the land and or making products. 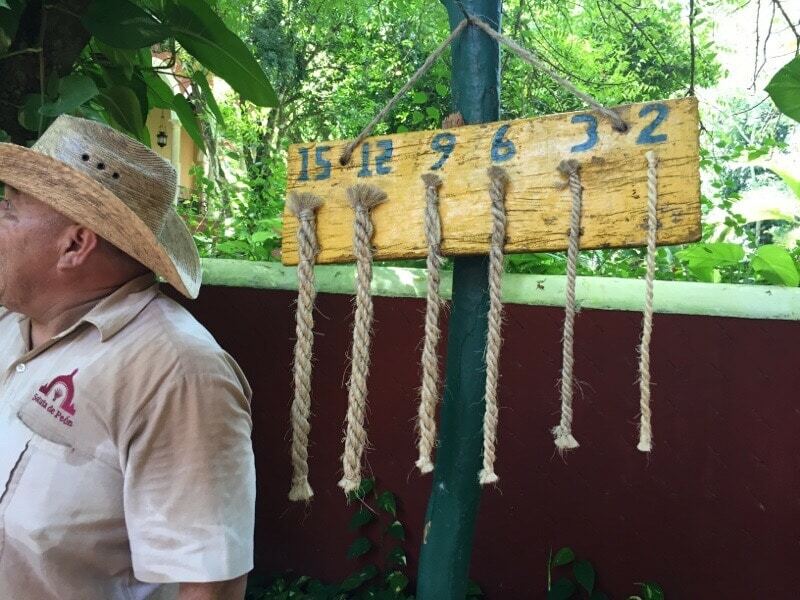 The Spaniards taught the Mayans how to spin the rope together to make thicker ropes and store it on spools that were bigger and stronger. The Spaniards also exported it all over the world and as their production grew they built machines to automate the process further. Teamwork, people. This region’s prosperity was built on this product, and it was nicknamed “Green Gold”. 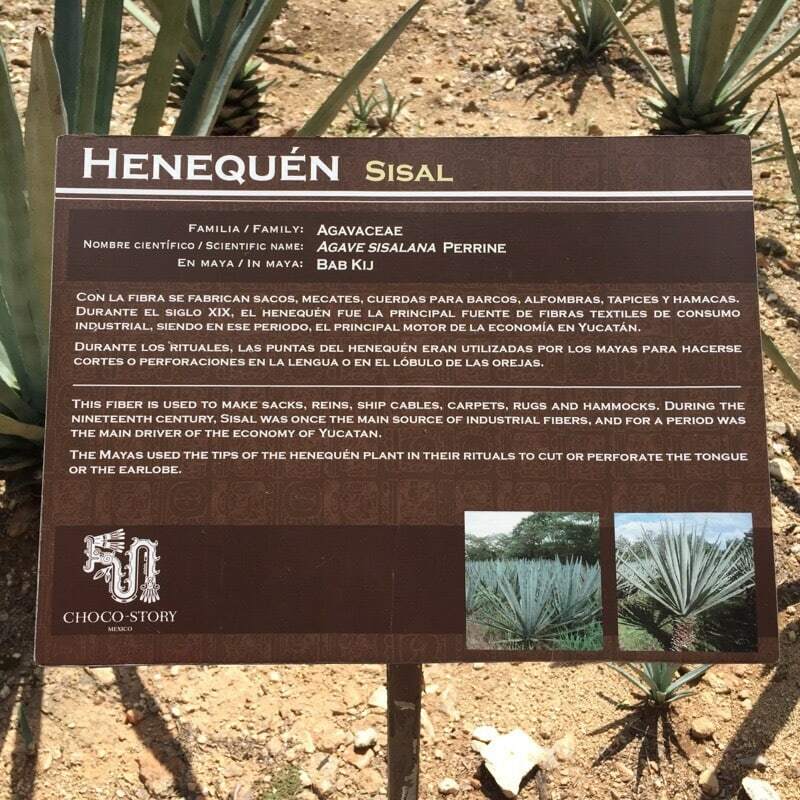 In fact, the product is known locally as henequen but outside this region it’s known as sisal. 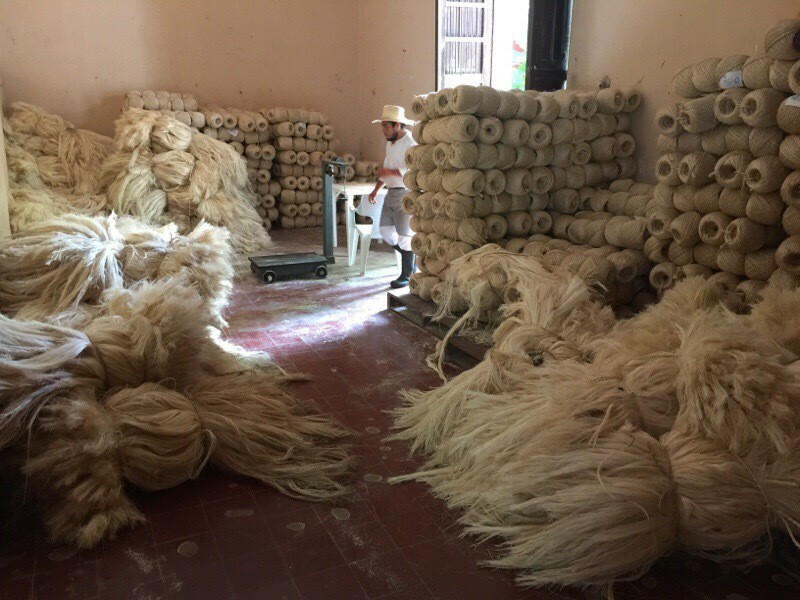 This is because the port that was closest to Hacienda Sotuta de Peon was called Sisal, and the boxes that were shipped with this product inside it all had “Sisal” stamped on them. 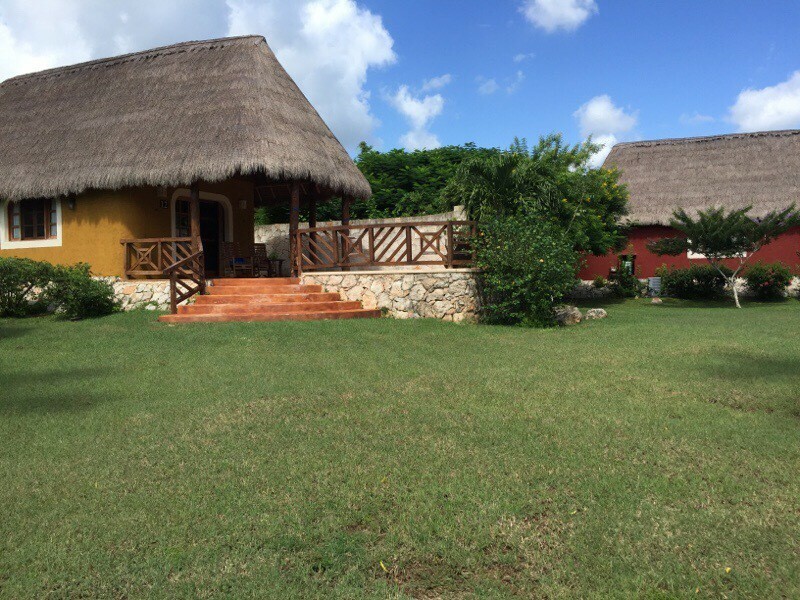 Thus, everyone outside of this area calls the rope sisal. If you search google for “sisal” you’ll find it sold at Walmart. It’s a real thing! This is the henequen plant. This sign sums it up nicely but I was told they didn’t use henequen for hammocks. Too rough. Due to synthetic materials and mass production, the Hacienda eventually ceased production and was purchased from the original owner 25 years ago. The new owner decided to restore it as best he could to the original workings and open it up as an educational tour, museum and hotel. 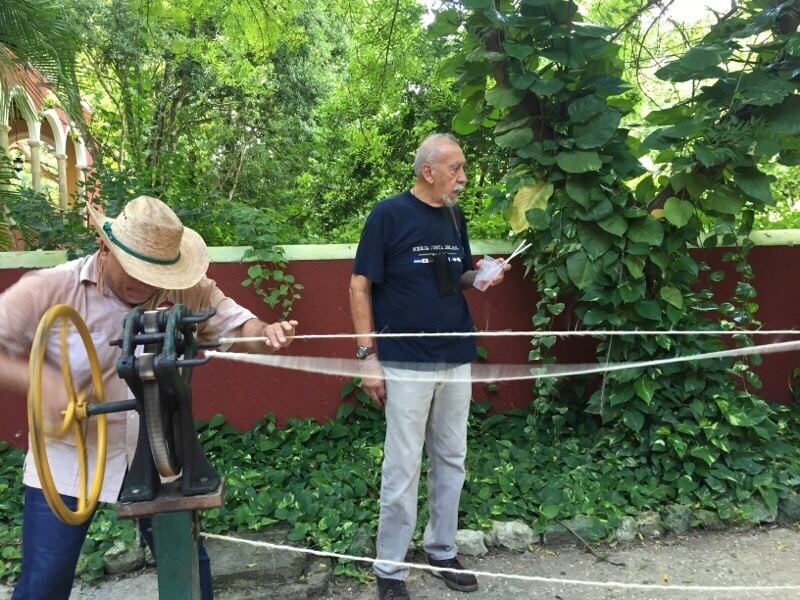 He even resurrected some of the machines that had been created to automate the rope-making process in order to show the full breadth of the historical life cycle of sisal. 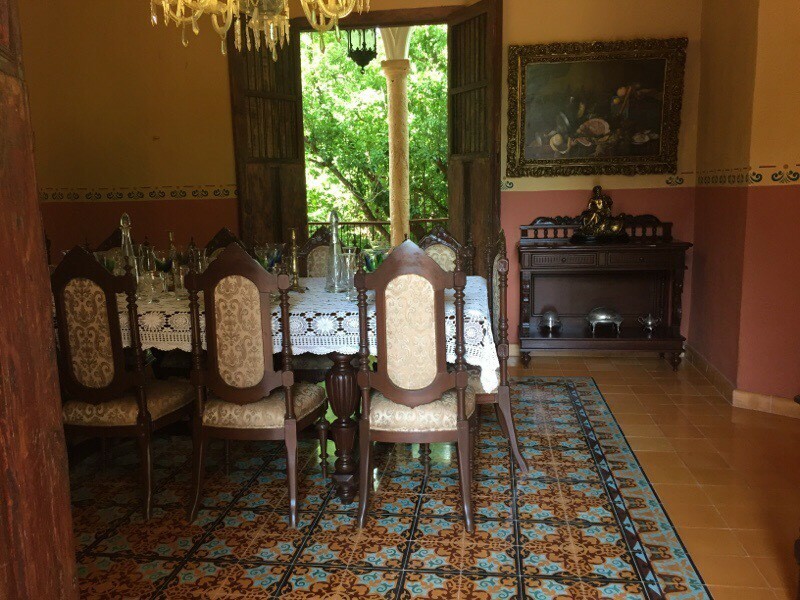 The first part of the tour was a viewing of the original hacienda buildings, with a kitchen and lovely dining room. The bedroom had a bed but our tour guide told us it was not usually used. In fact the hooks that were in each room were for hammocks, which were the traditional sleeping and napping arrangement. Beds are just too hot, he tells us. The Spaniard of that time would be so pleased with today’s technology of mattresses that keep you cool. Oh, and A/C. But I digress. This was the second floor of the hacienda, but they called it the first floor. The ground floor is called the basement, but it was not below ground because the ground was too hard to dig. For this reason in Mexico the first floor is “PB” for piso bajo and what we call the 2nd floor is their 1st floor. It still confuses us gringos in elevators. 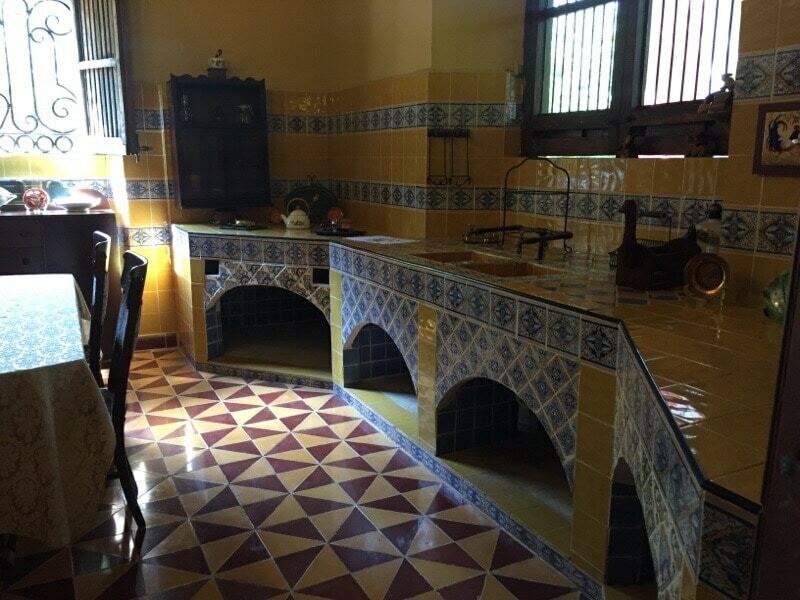 This is the kitchen of the hacienda. Zoe was fascinated how the stove is essentially some tiles on top of a fire place. This was the dining room restored with furniture from that era. 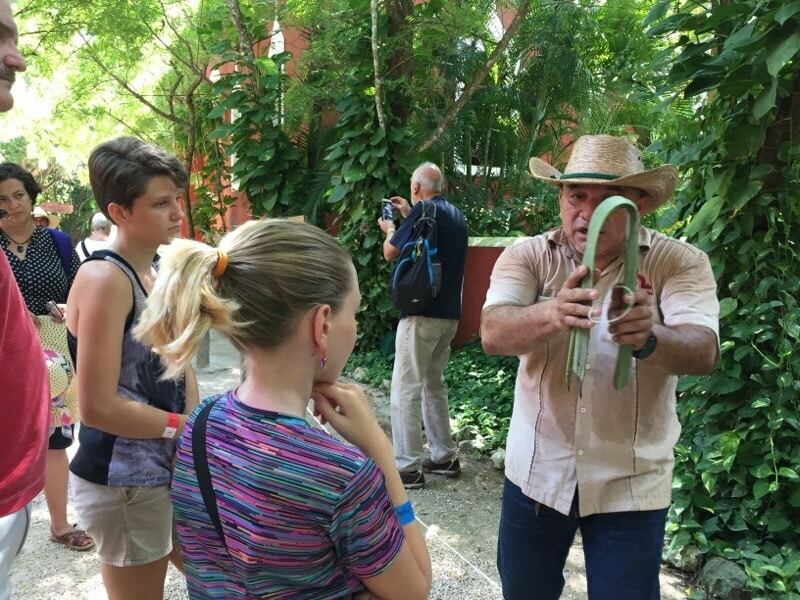 After seeing the hacienda buildings our guide started to explain the process of making the rope. 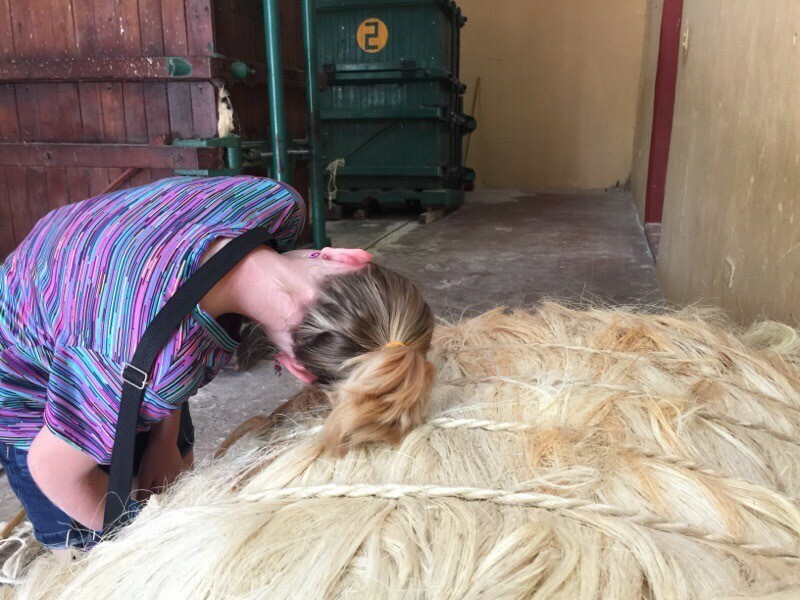 We saw how the fibers were taken from the plant, dried, combed, twisted and then spooled into rolls for shipping. 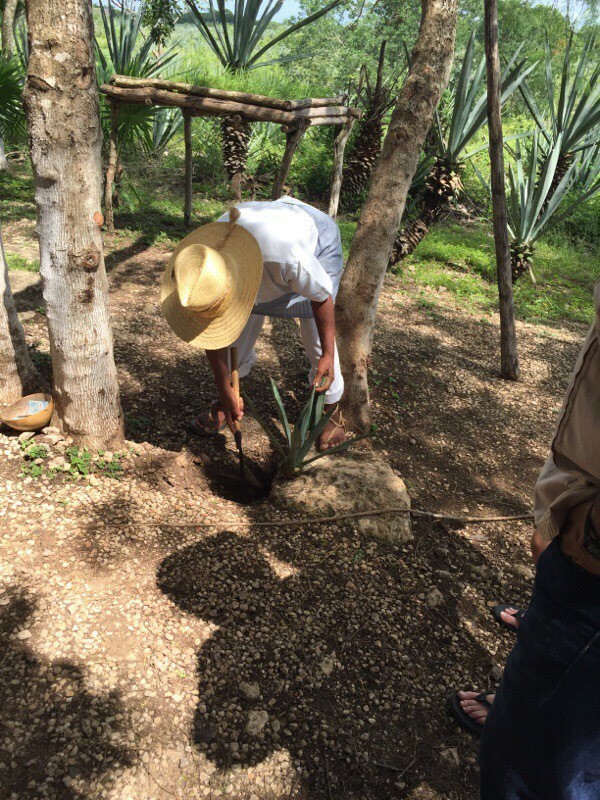 We saw the machines that did the process once automation took over, we saw the land where the plant grows and we met a Mayan man who had worked on that exact hacienda his entire life. Our guide showing us how they get the fiber out of the henequen plant. That’s what the threads look like when they are dried. This is the way you dry it by hand and “comb” it. I have combed long, tangled hair. I am a mother. I’ve totally got this. Even the guy in white is impressed I can tell. 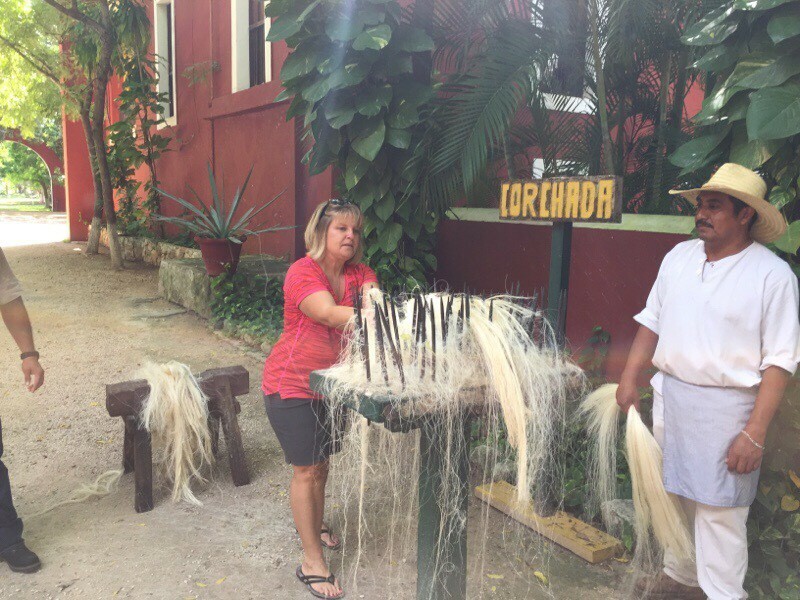 Twist the fibers together to make rope! This guy on our tour wandered into my pictures a lot. More ropes twisted together = more strength and a fatter rope. Other parts of the plant do not go to waste. They end up with a pulp-like water mixture after the fiber is extracted. 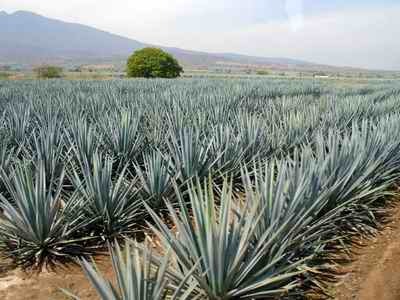 The pulp is good for fertilizer, feed for animals and even making a drink called sisal which is similar to Tequila. The hacienda leaves out huge tubs of the pulp for the locals to come and take for whatever they choose. Lots of rope ready for handicrafts, or for whatever you need rope for. Not hammocks, though. It’s too rough for hammocks. We thought it looked a lot like Zoe’s hair! 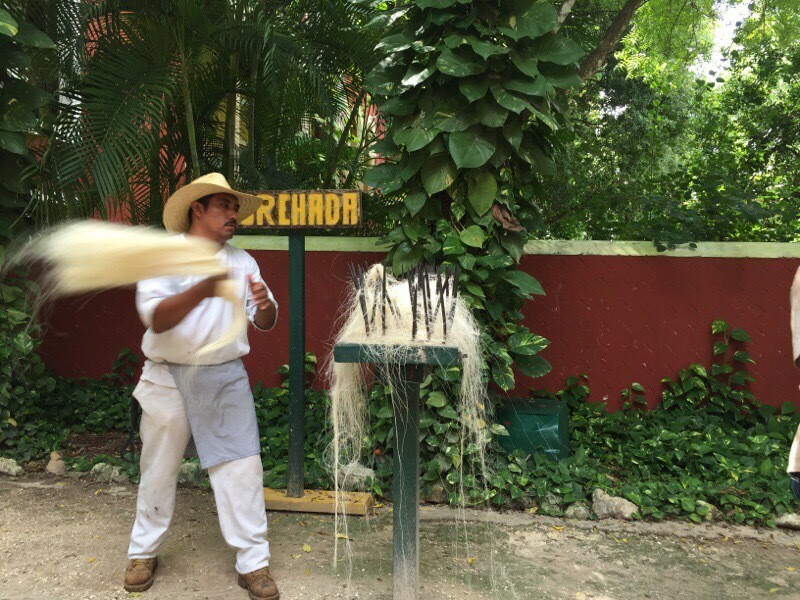 We had a bit of an ah-ha moment as the guide was telling us about the hacienda workers. In the height of the production many haciendas would pay the workers in some kind of local currency. Local, as in, local to that hacienda! Haciendas had stores where the workers could buy what they needed to provide for their families. This closed currency system greatly benefited the hacienda owners. The ah-ha moment came when we remembered that this exact same system took place in Guatemala on the coffee plantations, which we learned about during the coffee tour. I’m sure it took place all over the world, on cotton plantations and other farms. But it was a recurring theme that has now “stuck” in the minds of our kids. No social studies test here, people. We are connecting the dots through Worldschooling, baby! Alas, the rope is no longer a great seller. After some time, the Mexican government required haciendas to give up 90% of their land, which eliminated most of the land where the plant was grown. In addition, synthetic ropes were easy to make and this labor-intensive product just could not compete. After the tour they took us out to the cenote that they have on the property for a lovely swim. And by “they” I mean that a mule pulled us along a train track. The cenote was refreshing and cave-like with tons of interesting features. Haley and I found some rocks that had shells in them, even though we were probably over an hour from the ocean. Lots of “wow” moments there. Starting the mule-driven part of our tour. You can see some of the machines used to automate the rope process in the building on the right. You can also see a teenager getting tired and hot. We went past some of the bungalows that are the hotel rooms. So cute! 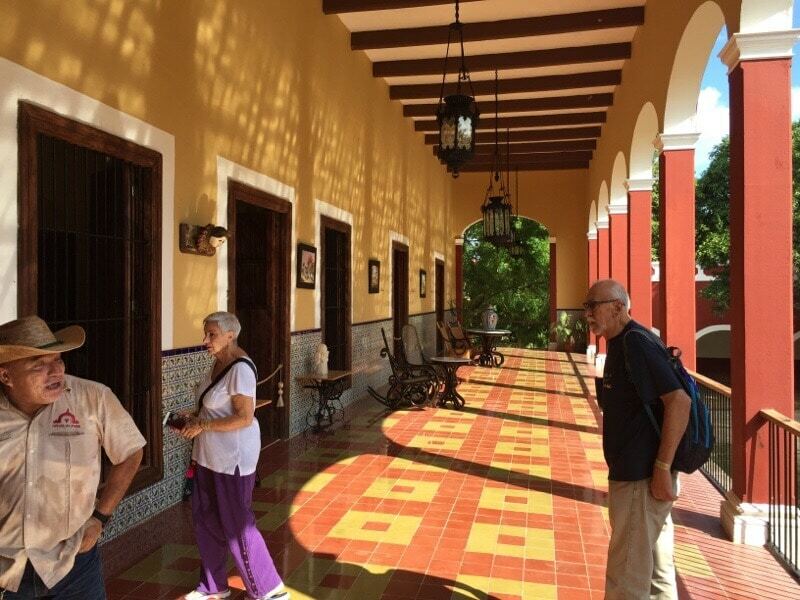 We stopped to talk to this guy who had worked on this hacienda his whole life. He was showing us how to plant a henequen plant. After an educational tour and a refreshing dip in the cenote, we declared it 4-thumbs up. It was worth getting out of bed early and definitely worth skipping those silly ruins. Who needs ruins when you can learn about rope?? !